The centuries immediately preceding the Great War were thought to be one of the most peaceful eras in Republic history. As it turns out the Sith Empire was actually using this time to plan and prepare for their push to take over the galaxy. There is also evidence that suggests the dark influence of the Sith was seeping into the Republic even during this time. In ﻿3756BBY young Jedi Knight Eison Gynt joined his Master Barel Ovair in a mission to investigate the Ancient Sith Temple of Yavin 4. On Yavin, the pair is attacked by the native Massassi and driven into the Tomb of Naga Sadow which always means bad news. The Jedi Master returned to Coruscant wounded and half-insane, remorseful that young Eison Gynt had been killed in the chaos. Years later, however, Gynt returned from Yavin on his own and attacked his former Master. Gynt was killed and all assumed that he had been tainted by the darkness on Yavin 4 and returned to Coruscant for revenge. 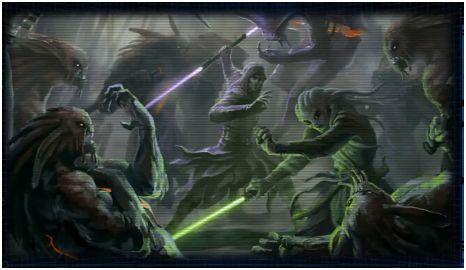 Why would Naga Sadow possess the young Jedi to only attack master Ovair? The truth is far more sinister. It turns out the Barel Ovair is from a family with generations of Sith infiltrators in the Jedi Order. 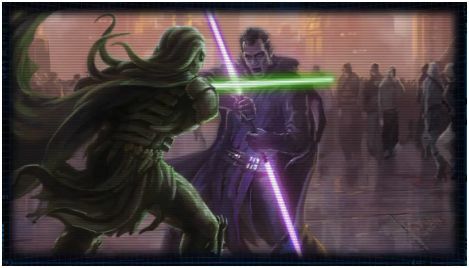 The Sith Emperor viewed the spirit of Naga Sadow as a threat for his return to the Galaxy. He sent Master Ovair to Yavin 4 as a preemptive attack to seal the tomb and remove Naga Sadow as a threat. This also begs the question what other matters of subterfuge were Barel Ovair's family involved in over the years of supposed peace? The Seventh in a series of video entries giving the back story for the new Star Wars MMORPG The Old Republic. Watch the video below. One might think it would have been smarter for the Jedi order to just blow up the Tomb of Naga Sadow since it continues to cause problems over time. Could such a bombardment be strong enough to penetrate the force energies wielded by the Dark Lords in the tomb? Is it smarter to keep such evil contained in one place or risk setting it free if the defenses could be penetrated?